Phoenix Group, stand outside the Warsaw Fire College. Given that more than 80 percent of the company’s other work is for the U.S. Department of Defense, this latest contract doesn’t rank as its biggest or most prestigious. It may, however, be one of the most meaningful to its long-term viability. Why? It’s the first major international contract that the Phoenix Group has gained since enrolling in the “Going Global” Defense Initiative (GGDI) to diversify its revenue streams. Virginia Economic Development Partnership (VEDP) began the program to help defense contractors offset the effects of federal budget cuts by finding opportunities in new markets. “We couldn’t have done any of this without the work and guidance from VEDP,” says Stephen Clock, Phoenix Group’s national sales director. 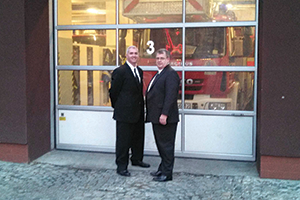 In addition to its work with the firefighting school, the company also has sold hazmat suits, respiratory equipment and other products to customers in Europe and Taiwan. Clock expects to hire two new employees soon to handle international sales. “Honestly, it would have taken years of work on our end just to make the connections that VEDP was able to provide to us, much less the rest of what we’ve been able to accomplish,” he states. From the start, Virginia’s defense contractors enthusiastically signed up for GGDI, Grossman says. All of the program’s available slots were filled quickly, with 160 companies accepted in the first year (and more placed on a waiting list) and an additional 64 enrolled the second year. “You can interpret that in one of two ways: It’s great that the program has been oversubscribed, but it’s bad because it reflects how desperate Virginia defense companies are with regard to declining federal spending,” he states. Virginia is a leading recipient of federal dollars, and a major portion of that money involves defense spending. More than 5,000 defense contractors make their home in the Old Dominion, largely in the Northern Virginia and Hampton Roads regions. They had $41.5 billion in DoD contract awards in fiscal year 2013, according to a report from the department’s Office of Economic Adjustment. Sequestration — automatic federal budget cuts that took effect in 2013 — hit Virginia companies and the commonwealth’s tax coffers especially hard. That is one reason many GGDI enrollees are pivoting their focus to overseas revenue opportunities — either by selling to foreign defense agencies or by developing nondefense applications for their products and technologies. Through the end of 2014, more than 50 GGDI companies had completed the compliance requirements of U.S. export control laws, and 185 companies are now participating in VEDP’s export promotion programs. VEDP’s network of in-country consultants in 57 nations has helped GGDI members complete 315 market research projects, 25 technical translation and adaptation programs and seven international product certifications. One of them is Cask LLC, an economically disadvantaged-woman-owned business and technology services firm in Stafford whose customers include the U.S. Marine Corps and U.S. Navy. Thanks to a $12,000 grant through GGDI and VEDP’s guidance and advice, Cask has put together a robust export compliance program in eight months and now sells to international customers. According to VEDP, the average Virginia defense contractor gets 68 percent of its revenues from U.S. defense agencies. “It’s simply not diverse enough to be a good business model,” Grossman says. Most companies have long recogn­­ized their vulnerability to budget cuts, but they haven’t had the funds, time or resources to pursue new revenue sources, especially overseas. 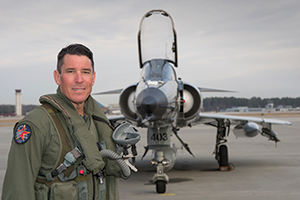 GGDI has helped companies overcome that hurdle, says Matt “Race” Bannon, director of strategy and marketing for Airborne Tactical Advantage Co. (ATAC), a Newport News-based contractor that provides supersonic aircraft training and exercises to the Pentagon. “We have such a narrow niche focus, and we knew that we had to go international if we wanted to expand our business base, so this program allowed us to go exactly where we already wanted to go with our strategic plan,” Bannon says.